On Saturday, I kicked off my race season with the Chicago Blade Runners, a local group of amputee runners that participates in several races throughout the year. 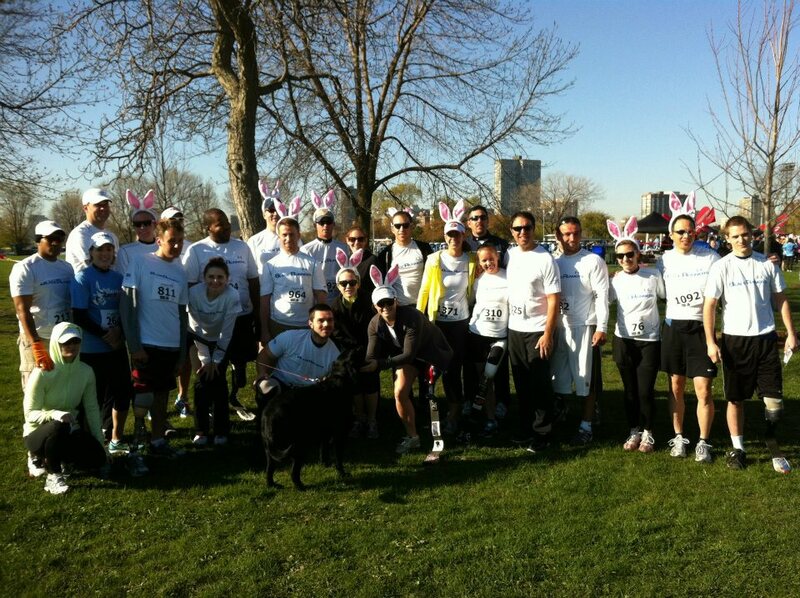 I joined 15 other Blade Runners for the Bunny Rock 5K along the Chicago lakefront. While the name of the race sounds like an Easter-themed dance that they have in third grade, the goodie bag comes with bunny ears, frat boy sunglasses, and marshmallow Peeps, so by my standards, it’s a pretty cool race. More importantly, this race was the one-year anniversary of my first-ever 5K. Now anniversaries of all sorts are always poignant for me, and they always seem to impact me more than any average person. I guess I like to use them as an opportunity for reflection, as if I don’t do enough of it already. Anyway, this anniversary was no exception, and I found myself thinking a lot about just how amazing this year has been for me and running. 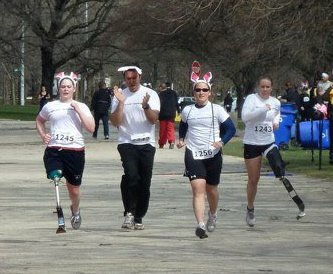 I will never forget the first time that I used a running leg back in February 2011. It was my first time visiting Scheck & Sires and my first time meeting Dave and Melissa. After I told them that I wanted to do a triathlon, they looked at each other, looked at me, and said, “Well let’s start now. Let’s get you running.” I looked at them like they were crazy. I hadn’t been running in eight years—how did they expect me to pick it up again in just one morning? But I agreed, and they attached a running blade to my socket and took me out to the hallway. Dave told me to bounce back and forth a few times so I could get a feel for the blade. Then he held my hand as we started to walk down the hallway. After a few steps, he told me to quicken my pace, then faster, then faster. And then, something magical happened. For the first time in eight years, I broke into a run. Having both feet in the air at the same time was a little jarring, but my fear soon turned to joy when I realized that this was the closest I’d ever felt to flying. I got to the end of the hall and turned around only to see Dave and Melissa right at my heels, smiling ear to ear. Dave gave me a huge hug and told me that I was a natural. Melissa did the same, then looked me in the eye and said, “Big things are about to happen for you.” In that moment, I felt like crying. After years of dreaming and wishing that this day would come, I had just run the length of a hallway. And then a Paralympic athlete and world champion told me that I was good. Talk about feeling empowered! I returned to Scheck several times over the next month as I got fitted for a new socket and ordered a running blade. Then in April, the leg was finally ready for me to take home with me. I picked it up from the office of a Friday, and while I was there Dave and Melissa asked me if I wanted to do my first 5K the following Saturday. That’s not entirely true: they didn’t ask me as much as they told me that I would be doing said race. The two of them have this incredible skill where they can not only talk you into signing up for a race that you are nowhere near ready for, but also make you believe that it is actually a good idea. 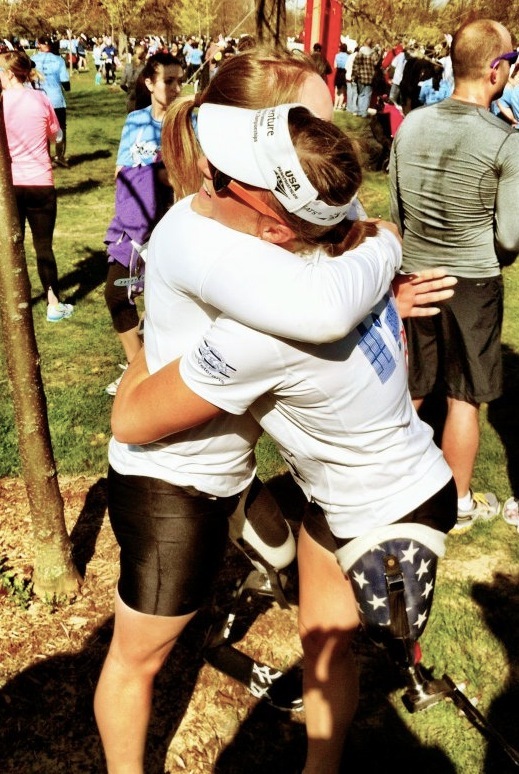 I’ve watched them convince another patient to do his first triathlon on a month’s notice; and just this weekend, they met an amputee who came to the race for moral support and persuaded him to walk in the race. I have to say that after spending so much time with Dave and Melissa, a lot of this has rubbed off on me as well. I think that we as people don’t give ourselves enough credit for what we are capable of doing. But the human body is a pretty incredible thing, and if we decide that we want to push it, I think it can really surprise us. Fear can be a powerful inhibitor, but if you don’t have time to think about how daunting something is, the role of fear is limited. Because of this, I now believe that the best way to do your first race is to just jump right in headfirst. After bringing my leg home with me, I spent the next few days running every chance I could. However, it wasn’t quite as glamorous as I had envisioned it. I had a hard time getting the socket to fit just right, and whenever my leg started to sweat (which would take all of three minutes) it would become so loose that I would have to stop and take it off. But having to make these frequent stops wasn’t the worst thing, because three minutes was about as long as I could go before I felt like my heart was going to beat out of my chest. I told myself that this learning curve was to be expected, and that it required way more energy to run with a prosthetic than it did to run with two legs. But that didn’t make the process any easier. There were many times that week and the weeks that followed when I doubted myself as a runner. I was frustrated with myself and my endurance, and there were instances where I questioned if this was really something I wanted to do. But every time that I thought about quitting, I would think about what Melissa told me that very first day I met her. She saw something in me that I had not yet seen, and as difficult as it was to do, I had to trust that she was right. Knowing that Melissa believed in me was the reason that I started to believe in myself. And as soon as I did that, everything began to come together. The morning of Bunny Rock quickly approached, and I was as nervous as I could ever be. Dave was right there with me, reminding me to relax, have fun, stand up straight, and smile. During the 3.1 mile course, I made frequent stops to catch my breath, dump the sweat out of my socket, and make adjustments to my leg. An hour later, I crossed the finish line and found my parents, my three sisters and the rest of the Blade Runners all there cheering me on. It had taken a long time (in fact, I may have been able to walk it faster) but I had crossed nevertheless. Although I was a little disappointed with how the race went, I knew that I could only get better from there. Plus, I had basically set myself up to win “Most Improved Athlete” for the season. As far as I was concerned, I had clinched it. After that race, I spent countless hours at Dave’s office, working on developing a socket that wouldn’t fall off when I sweat. After a couple months, a few prototypes, and lots of trial runs, we finally perfected the system. With all the logistical issues ironed out, I was able to run for longer periods uninterrupted. My stamina began to improve, and I started to get faster and faster. I joined the Blade Runners for a few more 5Ks throughout the summer and fall, dropping minutes in each race. By the end of the season, I had cut my Bunny Rock time in half! As I ran the Bunny Rock 5K on Saturday, I couldn’t help but think back to those first few days I spent running so many months ago. While I finished this year’s race just shy of my personal best, I couldn’t care less about the final numbers. I finished this year’s race 30 minutes faster than last year’s, and that in itself is enough reason to celebrate. It’s hard to believe that it’s been a year since all of this started, as so much has changed since then. I am proud of how far I have come and grateful for all those who helped me get there. If this is the difference that one year has made, I can only imagine what the next one will bring. All I know for certain is that it can only get better. Previous PostSpring Break: Mountain StyleNext PostTriathlon #1… check! So proud of you. The progress you have made in one year is more than most make in a lifetime. So excited to see what the future holds for you and I am hear to support you and cheer you on every step of the way. I love you and am excited for the 2012 season and beyond. I only hope the world is ready for the Hailanator.